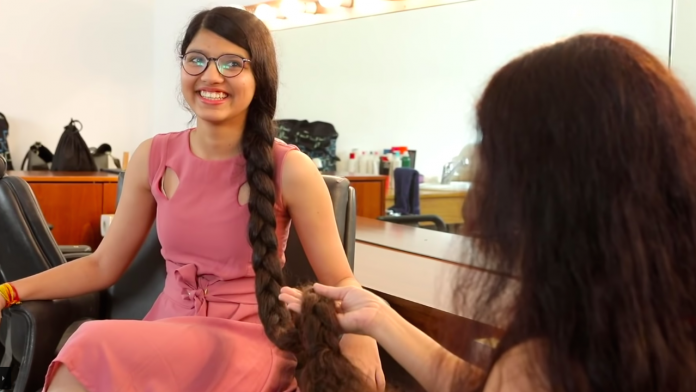 Nilanshi Patel Enters Guinness Book of World Records: A Gujarat girl who let her hair grow for ten years now holds the Guinness World Record for being the teenager with the longest hair in the world. 16-year-old Indian Girl Nilanshi Patel had stopped cutting her hair at the age of six after receiving a very bad haircut. Her decision has paid off, now that her hair has grown to the length of 5 feet 7 inches. The real-life ‘Rapunzel‘ said that she washed her hair once a week and her mother helped her braid and manage it. Patel revealed that every time she washed her hair, it took her half an hour to dry it and about another hour to comb it and get it in order. In a video uploaded by Guinness Book of World Records, the young record breaker said that she had no problem managing her hair. Nilanshi Patel, who is into playing table tennis, said that her long hair never got in the way of any of her activities. While braiding was an option, Patel said she preferred to have her hair tied in a bun on top of her head when participating in sports.